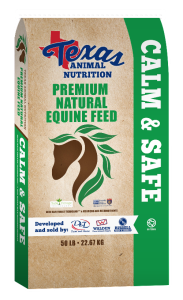 Texas Animal Nutrition Calm & Safe is a unique formulation, delivering “Natural” energy from Safe Forage Technology and plant based added dietary fat without added dietary starch from cereal grains. The combination of fat and fermentable fiber delivers needed energy for the horse, while helping to maintain attentiveness and focus during training and exercise. It is fully fortified with KER Micro-Max Micronutrients providing high-quality, research backed vitamins and minerals. Begin feeding the amounts given in the chart below based on the horse’s weight. Horses should be routinely evaluated for appropriate body condition; the feeding amount may be increased or decreased to obtain desired weight and body condition. Provide free-choice access to fresh water and salt. Limit meal size to 0.5 lb per 100 lb of body weight per meal. Consult with your veterinarian for more information about total health care for your horse. 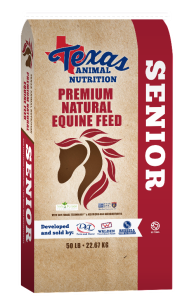 Texas Animal Nutrition Senior is a specially designed formulation for the senior horse, providing additional protein and highly digestible fiber, along with essential vitamins and minerals to support optimal health. This innovative platform of nutrition technologies is formulated for balance and support of horses in the later stage of their life. It is fully fortified with KER Micro-Max Micronutrients providing high-quality, research backed vitamins and minerals. lb of body weight per meal. Consult with your veterinarian for more information about total health care for your horse.